Ever since Fernando Alonso publicly made disparaging comments about his Ferrari car after the 2013 Hungarian Grand Prix, speculation has abounded as to his future with the fabled Ferrari team. Whilst Alonso had previously commented on his wish to remain at Ferrari for the rest of his career, and had signed a long term deal tying him to the team until the end of 2016, it appeared increasingly likely he could leave the team as their cars failed to provide with championship opportunities. At age 33 and coming closer to the end of his career, Alonso was increasingly motivated to add more world titles to his two already from his years at Renault in 2005-2006. Alonso should have won the 2010 world title in his first season with Ferrari, although a strategic error in the final race in Abu Dhabi meant he was stuck behind the Renault of Vitaly Petrov, and was forced to watch Sebastien Vettel steal his first world title from him. From here 2011 was a lean year as Ferrari struggled and Red Bull dominated, although 2012 saw Alonso wring every last ounce of performance from his once again poor Ferrari car, to take the championship title fight into the final race in Brazil. Despite leading the title fight for a majority of the year, Alonso once again was beaten by Vettel at the final race for the title. In 2013 Ferrari once again struggled with a poor car as Red Bull and Sebastien Vettel once again dominated, something Alonso grew increasingly frustrated with. After his response from a reporter asking what he would like for his upcoming birthday in the aftermath of the Hungarian Grand Prix, Alonso sarcastically responded with “someone else’s car.” These were ill timed comments from Alonso as there were persistent rumours at this time that Alonso and his manager were talking to Red Bull about potentially him joining the team to replace his great friend Mark Webber for 2014. After the prospect of an unlikely Red Bull move was quashed after Daniel Ricciardo was announced as their new driver, it seemed Alonso was stuck with Ferrari until the foreseeable future. This was not entirely a bad thing however, as many tipped Ferrari to benefit most from new 2014 regulation which saw a switch to turbo V6 power. The fact Ferrari would be the only team other than AMG Mercedes producing both their own cars and engines, which suggested they would have an advantage with the design of their 2014 car and engine. After a mixed testing period, once the season started it quickly became apparent AMG Mercedes would be dominant as the Mercedes engine was clearly the most powerful, with some even suggesting an 60-80bhp advantage over the Ferrari powerplant. It was also apparent the AMG Mercedes and Red Bull chassis were much better than the Ferrari F14T. Alonso once again performed heroics to drag the car onto the podium with a 3rd at the Chinese Grand Prix, it was clear however Alonso would once again miss out on the world title in 2014 as the two AMG Mercedes drivers Lewis Hamilton and Nico Rosberg dominated the season. Heads began to roll at Ferrari as team principal Stefano Domenicalli resigned after the Bahrain Grand Prix, to be replaced by the CEO of Ferrari North America, Marco Mattiacci. Despite having very little racing experience Di Montezemolo felt his success with Ferrari North America could help provide a fresh impetus to Ferrari. 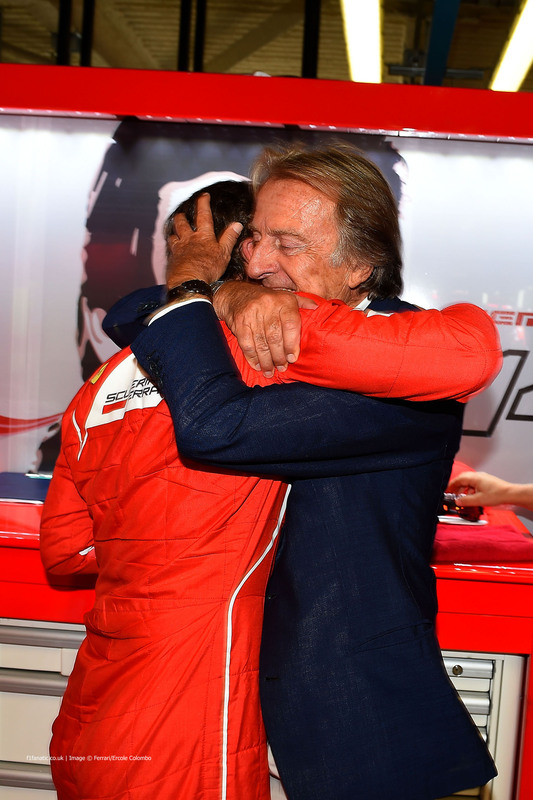 It was clear now that the relationship between Alonso and Di Montezemolo was strained. As the season wore on and Alonso struggled it also became clear Mattiacci felt Alonso could be deemed expendable as his frustrations and lack of commitment to Ferrari increased. This therefore provided a very unlikely initial rumour which quickly grew much larger. Honda were to join F1 in 2015 with McLaren, and it soon became clear Honda would provide an open chequebook to sign a top line driver. Whilst Sebastien Vettel laughed off the rumours, it soon became clear Alonso was seriously considering the offer. The news that long term Ferrari president Luca Di Montezemolo was to leave the team at the Italian GP did little to persuade Alonso to stay. This ongoing saga reached critical mass at the 2014 Japanese GP, where it became apparent in the build up to the weekend that Alonso and Ferrari had reached an agreement to terminate his contract after the 2014 season. In the next few days the bombshell was announced that Sebastien Vettel was to leave Red Bull, with their team principal Christian Horner letting the cat out the bag by announcing he was to join Ferrari. This development left Alonso in a weakened position as it now became obvious his only options for 2015 were to either join McLaren or take a sabbatical. After brief talk of Alonso potentially taking a year off and desperately trying to get himself into an AMG Mercedes seat for 2016 was shot down by the team, it became clear Alonso would likely sign for McLaren. Whilst the team has struggled in the past two years, and also Alonso’s turbulent season with the team in 2007, it appears fresh impetus from Honda will give Alonso a greater chance to be competitive and add the world titles his craves to his resume. McLaren with Honda will likely by Grand Prix winners within two years, whilst Ferrari are talking of several years of re-building before becoming dominant again. This is why Alonso was so keen to leave the team, as sticking around for several years of re-building will not leave him enough time to win any more world titles. This optimism is something McLaren can provide with their’s and Honda’s winning pedigree. An official announcement on Alonso’s move to McLaren is likely to come later this month, with the next big decision for the team being whether to retain either experienced Brit and key ally of Honda Jenson Button or the team’s young rookie Kevin Magnussen. Plenty of people in the paddock with be relieved when all the confirmations are revealed, as Alonso looks forward to developing the McLaren-Honda package in 2015. After the drama of the tumultous Belgian Grand Prix a month ago, things seems bleak for Lewis Hamilton as he sat 29 points behind his team mate and title rival Nico Rosberg, whilst he was also convinced Rosberg could of pulled out of their collision but didn’t on lap 2 of the race. Hamilton is known as a very emotional driver and some feared if this would throw his emotional balance out of place, potentially to Rosberg’s advantage. Things could not have gone better for Hamilton since however as he has won both the following Italian and Singapore Grand Prix’s whilst Rosberg has looked rattled as he made two mistakes to finish 2nd in the Italian GP before retiring from Sunday’s Singapore GP with a faulty wiring loom. Some will call this poetic justice for Rosberg as his 29 point lead from Belgian has been reversed into a 3 point lead for Hamilton going into the Japanese Grand Prix in two weeks time. 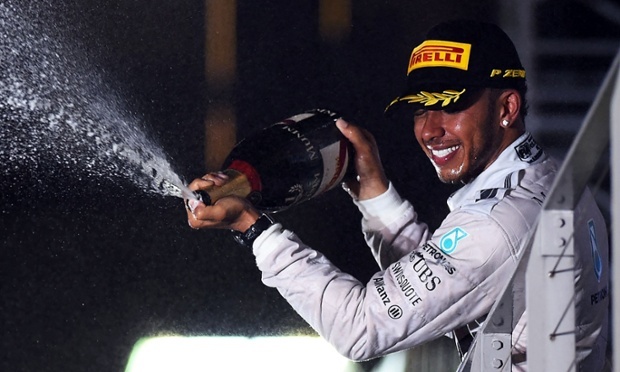 Hamilton shows his pleasure at dominating Sunday’s Singapore GP. What is crucial for Hamilton so far has been his emotional balance. He has looked very calm and at ease with his situation with the lack of pressure he seems to be putting on himself producing instant results as he has looked flawless in both races so far since all the drama of the Belgian GP weekend. Indeed, if it wasn’t for a faulty electrical glitch at the start of the Italian GP he would of likely dominated both races. The momentum he has now created for himself will prove crucial as he hopes to ride the crest of this pressure free wave until the end of the season as he searches for his second world title. A lot has been made in the past by journalists and team personnel around the paddock surrounding the emotional nature of Lewis Hamilton. He is a driver that always wears his heart on his sleeve and shows every emotion he goes through during a race weekend, much like fellow British racing hero Nigel Mansell showed during his career. Most notably in 2011 the significant downturn in his racing form was attributed to personal problems he was going through with family and his girlfriend, just showing the impact his emotional state has on his driving. That year he reflected his personal problems by consistently making clumsy mistakes such as a poorly judged move on the Williams of Pastor Maldonado at Monaco, with a clip below showing the clumsy nature of his attempted move into Ste Devote. Therefore with his emotional balance seemingly perfect over these past few race weekend’s, the results have been apparent as he now looks in pole position to secure a second drivers title barring any change in his psyche or any more reliability problems from his AMG Mercedes car. From here it will be thrilling to watch how Rosberg responds to the resurgent form of Hamilton as the title racing reaches a thrilling climax over the remaining race weekend’s. I simply cannot wait to see how it develops. After a morning of mixed weather conditions, the drivers were wheeled to the grid under a dry if overcast track. A likely threat of rain during the race kept the strategists guessing before the start, especially for AMG Mercedes as they tried to optimise their result with Nico Rosberg on pole and team mate Lewis Hamilton well down in 20th, after a gearbox penalty. From the start it was Nico Rosberg who comfortably made the best getaway, with the action unfolding behind him as Williams driver Felipe Massa and the fast starting McLaren of rookie Kevin Magnussen collided at the first corner. Whilst it appeared to be a racing incident, despite Massa’s protests of it being Magnussen’s fault, the end result was a spectacular flip for an uninjured Massa and a severe derailment to Magnussen and Red Bull man Daniel Ricciardo’s race. The Safety Car was scrambled for one lap to retrieve Massa’s stricken Williams, before the re-start which saw the other Williams of the quick young Finnish driver Valtteri Bottas try his best to hang onto the Mercedes of Rosberg out front. The advantage of the Mercedes is such that Rosberg was comfortably able to open a gap to the rest, as the attention focused back to the recovery drives of the other Mercedes of Hamilton and Ricciardo. Both were flying through the field with apparent ease, reaching the fringes of the top 10 by lap 8. A lap later and they receiver further help as Scuderia Toro Rosso rookie Daniil Kvyat hit the Sahara Force-India of Sergio Perez he was battling, with replays showing Kvyat didn’t give Perez enough room when attempting the pass at Turn 8. Hamilton then made several more places with an audacious double pass on Ricciardo and the Ferrari of Kimi Raikkonen going into Turn 6 after the back straight on lap 13, with a slight nudge on Raikkonen the only contact between the three. 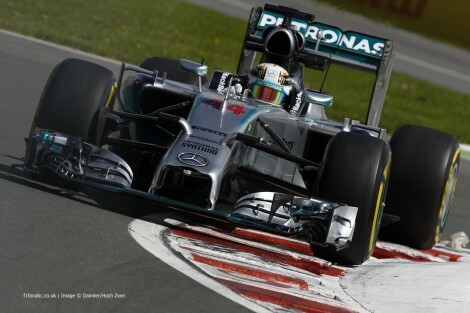 The left Hamilton 8th and climbing as others around him started pitting for new soft tyres. The top 2 Rosberg and Bottas pitted on lap 15, re-joining either side of Hamilton. A long first stint appeared to be paying off for Hamilton as he easily held 3rd, before his tyres started giving up on lap 22, subsequently losing him roughly 1 second a lap before his finally pitted from 3rd on lap 26, re-joining 8th. Back at the front, and Rosberg was serenely building a 13 second advantage over Bottas in 2nd as he appeared to be cruising to a first home victory. On the other hand, Hamilton was having anything but a serene race as he battled back through the pack for a second time, giving Jenson Button in his McLaren a love tap to the side pod exiting Turn 6 after a misunderstanding. Although he attempted to apologise later on the damage was already done as the front wing damage to the Mercedes was enough to hamper his tyre management for the rest of the afternoon. As the second pit stop window began from roughly lap 33, the action intensified as reigning champion Sebastien Vettel and former champion Fernando Alonso carried over their epic battle from the British GP two weeks ago. Eventually it was Vettel who was able to use newer tyres to pass the Ferrari of Alonso for 4th some laps later. Both the Mercedes drivers were now complaining about their tyres, something they rectified as they stopped on lap 41 and 42 respectively. For Rosberg this was simply routine, yet for Hamilton it was anything but. His stop signalled a drastic change of strategy from a two to a three stop race. This left him able to charge down the rest with a short stint on the super soft tyres, before a conservation final run on another set of the super soft tyres. Lap 50 saw Sauber driver Adrian Sutil suffer a strange spin exiting the final corner, leaving the car unable to re-start precariously and potentially necessitating a late Safety Car. Sensing a potential Safety Car, Mercedes gambled on pitting Hamilton to steal a remarkable 2nd place a lap later. The Safety Car never materialised leaving thing tough for a potential podium now. Things improved however as Alonso pitted with tyres that were completely shot on lap 55, leaving Hamilton 3rd and chasing down Bottas who was also struggling with his tyres in 2nd. Behind them Ricciardo was also using new tyres to charge up the field, although he soon had Fernando Alonso’s Ferrari on his rear wing challenging him for his 5th place. What ensured was a truly brilliant battle between the two as they constantly changed places over successive laps, until the fun was ended as Alonso finally made it through on lap 62 exiting Turn 9. From her the attention for the final laps turned to Hamilton, who was desperately trying to pass Bottas but to no avail as Bottas held on behind a dominant Rosberg for 2nd , with Hamilton completing the podium in 3rd. Sebastien Vettel came home a quiet 4th from Alonso in 5th and Ricciardo coming home 6th. Nico Hulkenberg delivered again in 7th, with Jenson Button in 8th from team mate Magnussen who recovered well to come home 9th. 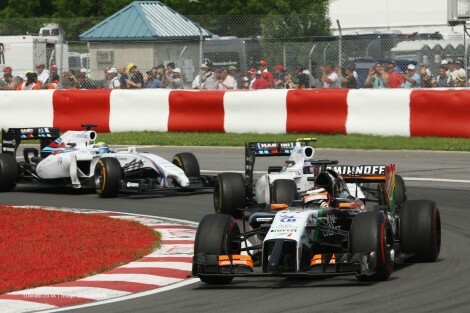 Completing the top 10 was Sergio Perez in 10th. From here the F1 circus moves on to Hungary before a well deserved 3 week break for the F1 paddock before the final run in begins at Spa in Belgium.